Reduction of operational carbon emissions from buildings is the primary sustainable construction driver in the UK. Through the Climate Change Act, the Government has set an ambitious and legally binding target to reduce national greenhouse gas emissions by at least 80% by 2050 with an intermediate target of a 34% reduction by 2020 (against a 1990 baseline). In addition, the Energy performance of buildings Directive (EPBD) requires all new buildings to be 'nearly zero energy' by December 2020. The operation of buildings currently accounts for nearly half of the UK’s greenhouse gas emissions and therefore significant improvement in new and existing building performance is required if these targets are to be met. This article describes operational carbon assessment and targets, energy efficiency measures and low and zero carbon technologies and presents results from a recent study. The focus is on new non-domestic buildings. Operational carbon is the term used to describe the emissions of carbon dioxide during the operational or in-use phase of a building. Emissions arise from energy consuming activities including heating, cooling, ventilation and lighting of the building, so called ‘regulated’ emissions under Part L of the Building Regulations, and other, currently ‘unregulated’ emissions, including appliance use and small power plug loads such as IT. These appliances are not currently regulated because building designers generally have no control over their specification and use and they are also likely to be changed every few years. Although building operation can include other activities including cleaning, maintenance, repair and replacement, etc. these activities are not generally included within the definition of operational carbon. It is noted however, that robust building Life Cycle Assessment and carbon foot-printing studies do include these activities. It should also be noted that operational carbon emissions are generally measured in terms of carbon dioxide (CO2) emissions, rather than greenhouse gas emissions that include a basket of greenhouse gases which are measured in terms of carbon dioxide equivalents (CO2e). Embodied carbon impacts are generally measures in terms of carbon dioxide equivalents. In 2007, UK Government has announced its aspiration for new non-domestic buildings to be zero carbon in operation by 2019; since that time, Government has investigated and consulted on the definition of ‘zero carbon’ for non-domestic buildings. As a minimum, Government stated that the zero-carbon destination for non-domestic buildings will cover 100% of regulated emissions, i.e. a Building Emissions Rate (BER) of zero. Energy Efficiency measures - to ensure that buildings are constructed to very high standards of fabric energy efficiency and use efficient heating, cooling, ventilation and lighting systems. The current proposal for non-domestic buildings, following the precedent set for domestic buildings, is to set a minimum standard for energy efficiency based on the delivered energy required to provide space heating and cooling (kWh/m2/yr). The level for this standard has currently not been set for non-domestic buildings. Carbon Compliance on or near site. 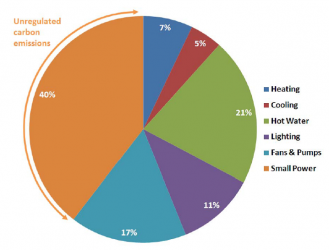 This is the minimum level of carbon abatement required using energy efficiency measures plus on-site low and zero (LZC) technologies or directly connected heat or coolth. The level for this standard has currently not been set for non-domestic buildings. Allowable Solutions – a range of additional beneficial measures to offset ‘residual emissions’, for example exporting low carbon or renewable heat to neighbouring developments or investing in LZC community heating. The most recent government sponsored research into carbon compliance targets for new non-domestic buildings suggests that the average reduction in regulated emissions (via energy efficiency and on or near site LZC technologies, i.e. Carbon Compliance) required to achieve the 2019 ‘zero carbon’ target will be between 44% to 54%,(relative to Part L 2006) although this is likely to vary greatly between different types of building, with the balance achieved via the use of allowable solutions. It is noted however, that these reduction targets are not definitive government policy. In July 2015, the UK Government announced that, as part of its Productivity Plan, the zero carbon buildings policy was to be dropped to reduce regulation on house builders. In particular, government has stated that it ‘does not intend to proceed with the zero carbon Allowable Solutions carbon offsetting scheme, or the proposed 2016 increase in on-site energy efficiency standards. Government will keep energy efficiency standards under review, recognising that existing measures to increase energy efficiency of new buildings should be allowed time to become established”. This effectively means that the 2016 zero carbon homes target has been dropped, as has the 2019 target for non-domestic zero carbon buildings. It also means that there will be no further changes to Part L in 2016. It has been clear for some time that the offsetting elements of the Allowable Solutions scheme did not fulfil the requirements of the EU Energy Performance of Buildings Directive, under which the UK has to deliver ‘nearly zero’ energy buildings from 2021 (and 2019 in the public sector). The challenge for UK Government therefore is how to comply with the requirements of the Directive in the absence of any policy. The London Plan requires each major development proposal to submit a detailed energy assessment. The purpose of an energy assessment is to demonstrate that climate change mitigation measures are integral to the scheme’s design and evolution, and that they are appropriate to the context of the development. The Greater London Authority (GLA) provides guidance to accompany strategic planning applications. Each assessment is required to demonstrate how the targets for regulated CO2 emission reduction over and above 2013 Building Regulations will be met using the Mayor’s energy hierarchy. In October 2016 the GLA introduced a zero carbon standard for new residential developments. The Housing SPG defines ‘Zero carbon’ homes as homes forming part of major development applications where the residential element of the application achieves at least a 35% reduction in regulated carbon dioxide emissions (beyond Part L 2013 requirements) on-site . The remaining regulated carbon dioxide emissions, to 100%, are to be offset through a cash-in-lieu contribution to the relevant borough to be ring-fenced to secure delivery of carbon dioxide savings elsewhere. For commercial development whilst the GLA target sets the Building Regulations as the target, Part A of the policy seeks to minimise carbon dioxide emissions and GLA monitoring indicates that a 35% reduction target is achievable for new, non-domestic buildings. Given this evidence, GLA will continue to require that non-domestic development seek to achieve a 35% reduction against Part L 2013 requirements. The original Energy Performance of Buildings Directive (EPBD-1) was a core response by the EU to greenhouse gas reduction targets agreed under the Kyoto protocol. When the Directive was adopted in December 2002 there were 160 million buildings in the EU, and it was anticipated that the Directive could deliver 45 million tonnes of carbon dioxide reduction by 2010. By 2007 the EU had committed to even more stringent targets - in particular to a reduction of 20% in the EU’s total energy consumption by 2020, and a binding target for renewable energy of 20% of total supply by the same year. Individual Member States had also set their own national targets. It was clear therefore that there was a need to strengthen the provisions of the Directive and have a more thorough and rapid implementation. At the same time, it was acknowledged that there had been a wide range of responses from Member States to the provisions of the original Directive, and that this variability should not be allowed to continue. Hence the second directive (known as the ‘recast EPBD’ or EPBD-2) was drafted and adopted in May 2010, effectively replacing the original. It generally tightened up the performance standards, reduced the building size thresholds which trigger certain actions, and strengthened the requirements for display of information and inspection of plant. Article 27 penalties for non-compliance must be introduced. In England, the Government issues and approves Approved Document L (Conservation of fuel and power) to provide practical guidance on ways of complying with the energy efficiency requirements of the Building Regulations. In Wales, similar Approved Documents are published by the Welsh Government. 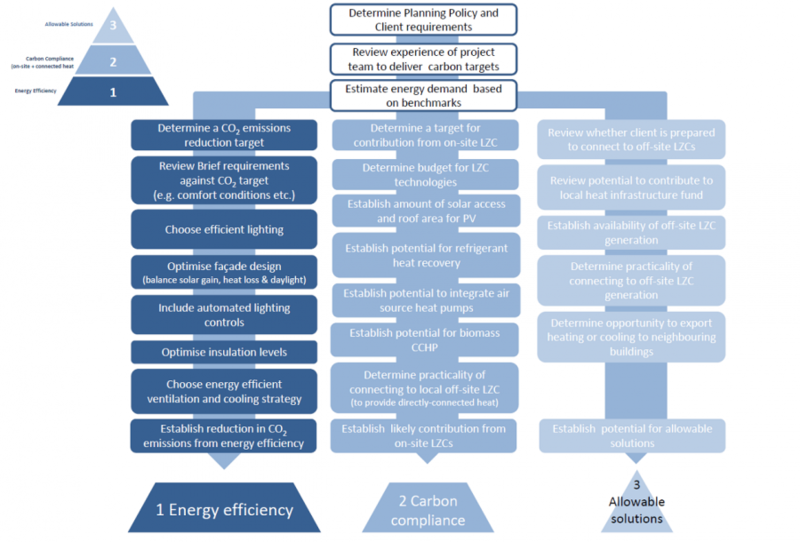 Approved Document L has evolved over recent years to implement the requirements of the EPBD at a national level and has a key role to play in defining suitable intermediate steps on the trajectory towards zero carbon buildings. Approved Document L is currently updated on a three year cycle with the next revision due in 2016 (although a Government statement in July 2015 indicated that no changes will be made at that time). The intention of Approved Documents is to provide guidance on compliance with specific aspects of Building Regulations for some of the more common building situations. They set out what may be considered as reasonable provisions for compliance with the relevant requirements of the Building Regulations to which they refer. If Approved Documents are followed then there is a presumption that the requirements of the Building Regulations have been met, although this can be overturned. Approved Documents generally include a disclaimer that they may not be suitable for unusual buildings and also state that there is no requirement to adopt the solutions if it can be shown that the requirement of the Building Regulations can be met in other ways. Nevertheless, the great majority of buildings are designed to comply with the Building Regulations via the processes outlined in Approved Documents. Checks to ensure control of solar gain and overheating. Throughout the remainder of this article, it is the English versions of the Approved Documents (or ADs) that are referred to. It is noted that under the 2013 Part L Regulations, the Approved Document covering new, domestic buildings in England (Part L1A, 2013) includes Fabric Energy Efficiency Standards (FEES) alongside the existing CO2 emissions targets. This FEES target is set at approximately the interim FEES level as recommended by the Zero Carbon Hub. It is not clear whether this approach will be extended to non-domestic buildings in the future. Government currently considers that the range of non-domestic building types is too large to develop absolute or mandatory fabric energy efficiency targets at this stage. Part L criterion 1, compliance modelling is not meant to accurately predict the energy consumption of a building, but rather to assess its carbon emissions on a comparative scale. The modelling method that must be used is prescribed by the National Calculation Methodology (NCM). 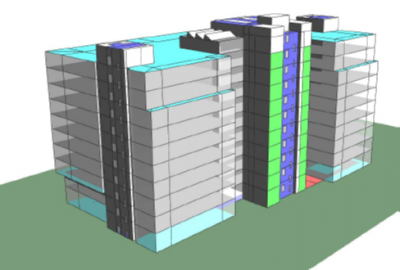 The NCM allows the calculations to be carried out either by dynamic simulation software approved by the Department of Communities and Local Government (CLG), or the Simplified Building Energy Model (SBEM), a simplified tool developed by the Building Research Establishment (BRE) purely for Part L compliance analysis. The purpose of SBEM is to produce consistent and reliable evaluations of energy use in non-domestic buildings for Building Regulations Compliance and for Building Energy Performance Certification purposes. The selection of tools is open to the designer but it is recognised that SBEM is relatively limited and is unable to model a number of options. The main requirement is that the calculated (predicted) CO2 emissions rate from the building as built (BER), is less than or equal to the Target CO2 Emissions Rate(TER). The calculated emission rate of CO2 is based on the annual energy requirements for space heating, water heating and lighting, less the emissions saved by renewable energy generation technologies and makes use of standard sets of data for different activity areas and call on common databases of construction and service elements. For non-domestic buildings, the Building CO2 Emissions Rate (BER) must be less than the TER. The BER and TER are calculated using a monthly quasi-steady state energy balance methodology SBEM (Simplified Building Energy Model) based on BS EN ISO 52016-1, with lighting from BS EN 15193, or by using approved dynamic simulation modelling software such as IES-VE or TAS. The SBEM software package produces a virtual model of the building. Standard operating conditions for each building type are defined in the National Calculation Methodology (NCM) and are applied to the building being assessed. The 2006 revisions to Approved Document L2A required a 23.5% saving (in regulated emissions) over the 2002 standards for fully naturally ventilated spaces and 28% savings for mechanically ventilated and cooled spaces. Revisions to Part L2A in 2010 required a further 25% (average) reduction in regulated emissions over the 2006 requirements for non-domestic buildings. In recognition of the variation in energy demand profiles in different non-domestic building types and hence the cost-effectiveness of achieving carbon emission reductions in different building types, Part L2A (2010) adopted an ‘aggregate’ approach for non-domestic buildings. Under this approach, different building types are required to achieve larger or smaller operational carbon emission reductions than the ‘average’ 25%. Targets are set based on predicted new build rates for different building types over the assumed 10-year policy period. The carbon reduction targets in the 2013 (England) regulations are less than initially proposed during the consultation period. For new homes, Part L 2013 represents a 6% aggregate uplift in CO2 targets compared to the 2010 requirements. For new non-domestic buildings, the regulations represent a 9% aggregate uplift, significantly lower than the 20% improvement initially proposed (mainly in response to Government’s deregulatory and growth agendas). Although the aggregate CO2 emissions uplift or improvement for new non-domestic buildings is 9%, this varies, by building type, between 3% for small warehouses to 13% for a shallow plan office. Air permeability 5 m3m-2hr-1 in side lit and 7 m3m-2hr-1 in toplit buildings for buildings with a gross internal area of less than 250 m2 – air permeability targets for larger buildings are lower. Energy efficiency measures can be broadly defined as changes to the building which will reduce the demand for energy and in so doing reduce operational carbon emissions. In general, they include measures to improve the thermal performance of the building envelope and improvements to the buildings services. The table gives an overview of the various types of energy efficiency measures most often considered for improving the operational energy efficiency of new, non-domestic buildings. The graph shows the predicted (modelled) reductions in operational carbon dioxide emissions achieved by introducing a number of individual energy efficiency measures into a large, air-conditioned, city centre office building. It is noted that the measures yielding the greatest reductions are not necessarily the most cost effective. The results are from the Target Zero research programme. The graph shows that, in this case, the measures with the greatest predicted impact are those related to space cooling and fan and lighting efficiencies. Most of the building fabric improvements are predicted to yield only small reductions in carbon dioxide emissions. The pie chart shows the predicted breakdown of carbon dioxide emissions, by energy demand, for the same office building. Energy efficiency measures which affect the heating/cooling balance of buildings can be difficult to optimise. This is because the proportion of annual carbon emissions from space heating and cooling are often very similar; as is the case for this office building. 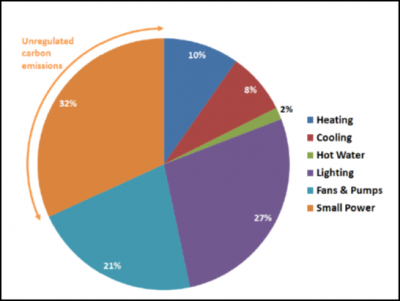 As a consequence, energy efficiency measures which tend to reduce fabric heat losses or increase solar gains will reduce the emissions from space heating, but also increase those from cooling. Similarly measures which increase heat loss or reduce solar gain will increase the emissions from space heating but reduce those from cooling. The net effect can be very small. Energy efficiency measures generally incur a capital cost premium. An exception to this is reduced glazed area which can yield a capital cost saving. It is important therefore that the capital cost of energy efficiency measures is balanced against the operational cost savings, i.e. through lower utility bills. This approach is consistent with the targets being set in Government’s hierarchy for defining zero carbon non-domestic buildings. 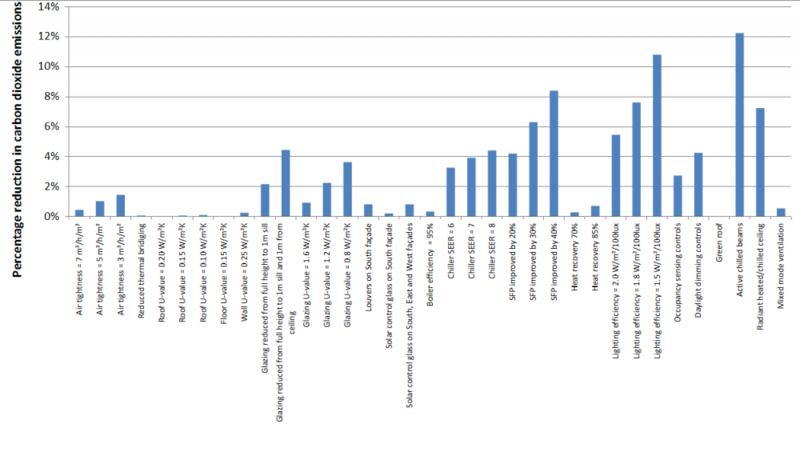 The figure shows the cost effectiveness of the same set of measures as shown above. Their cost-effectiveness has been calculated based on a 25-year NPV per kg of CO2 saved per year and measures have been ranked in order of cost-effectiveness. The NPV (Net present value) includes all capital, maintenance and replacement costs and resulting energy savings, over a 25-year period. All ongoing costs are discounted back to their current present value. A discount rate of 3.5% has been used. The figure shows that the energy efficiency measures involving an improvement to the fabric thermal insulation performance of building elements (green bars in the figure) are generally not very cost effective, i.e. they have a high NPV cost per kgCO2 saved. This is, as has been previously discussed, largely because the addition of thermal insulation increases the cooling load in summer as well as reducing the heating load in winter. Therefore the net carbon saving from such measures is relatively small and hence their cost effectiveness is relatively low. When a range of different energy efficiency measures is to be employed, it is important that their compatibility is established. For example, more efficient lighting will generate less heat and therefore the heating demand will be increased and the cooling load could be reduced. The interaction of these different effects is complex and therefore expert advise, supported by dynamic thermal modelling, should be employed. Further, more detailed, information and guidance on energy efficiency measures is provided in the Target Zero design guides. Low and zero carbon (LZC) technologies can be broadly defined as technologies which meet building energy demands with either no carbon emissions, or carbon emissions significantly lower than those of conventional methods. There are, however, a number of grey areas in this definition such as ground source heat pumps which are generally classed as low carbon technologies but which can be less efficient than modern high efficiency conventional cooling plant. 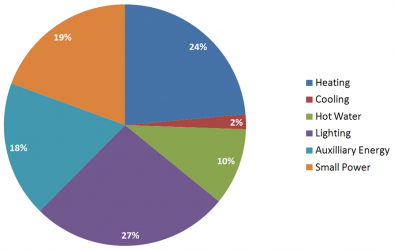 An overview of the various types of generic LZC technologies most often considered for use on new, non-domestic buildings is shown. The suitability of different LZC technologies to different building types and locations can vary significantly and, as for energy efficiency measures, it is important that whole life costs are assessed to arrive at optimum solutions for a specific building. This assessment is further complicated by the introduction and changes to subsidies such as Feed-in tariffs (FITs) and the Renewable Heat Incentive (RHI). It is important, when choosing on-site LZCs, that their compatibility with energy efficiency measures and any other LZCs is probably considered. The Target Zero programme gives detailed guidance on the most cost effective routes, i.e. 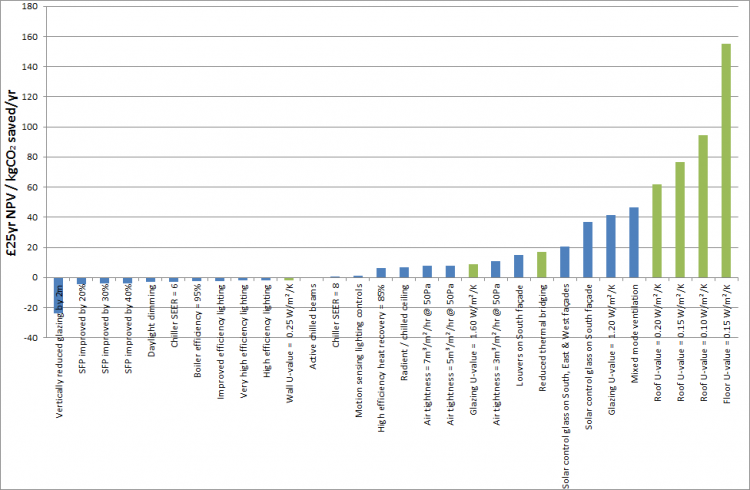 combinations of energy efficiency measures and LZC technologies, to achieve future likely Carbon Compliance targets and true net zero carbon buildings. An understanding of the breakdown of operational energy use (and associated carbon emissions) in buildings is important to focus the designer’s attention on where the greatest improvements or savings can be achieved. 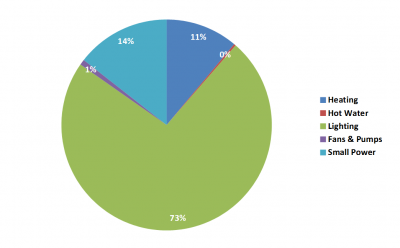 Although all buildings are different and actual performance will differ from predicted performance, the pie charts give the breakdown in operational carbon emissions (by energy use) in four of the five non-domestic buildings studied in the Target Zero programme. The 5th (office) building breakdown has been previously described. All buildings were designed to meet the minimum requirements of Part L2A 2006. 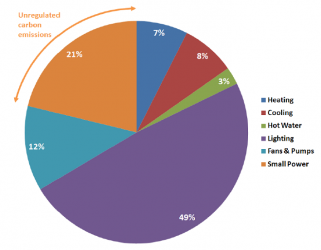 Heating and cooling emissions are very similar in the office, supermarket and mixed-use buildings. Further, more detailed, information and guidance on the breakdown of operational carbon emissions in non-domestic buildings is provided in the Target Zero design guides. Development of optimum solutions for low and zero carbon non-domestic buildings is complex. Optimum solutions require collaborative and early involvement of all parts of the design team. The flowchart gives guidance on how to develop cost-effective solutions for low or zero carbon buildings. This example is specifically tailored to commercial office buildings but is equally applicable to other non-domestic building types. The Target Zero design guides provide detailed guidance and information on optimum solutions to achieve current and future possible low and zero carbon targets. Key recommendations for developing low and zero operational carbon solutions are set out below. Client commitment to achieving sustainable and low and zero carbon targets should be captured in terms of a clear brief and target(s), for example, a 70% improvement in regulated carbon emissions or an Energy Performance Certificate (EPC) A rating. The brief, and any operational carbon targets, should specify the contribution to be made from on-site LZC technologies and whether the client is prepared to connect to offsite technologies. This should also take account of any funding or local planning requirements, such as a policy requiring a minimum proportion of a building’s energy needs to be met using renewable energy. Undertaking the relevant analyses and integration of design early enough on a project is key to ensuring that the design is maximising its potential for low carbon emissions at minimum cost. The provision of easy-to-understand, accurate cost advice early in the design process is key to developing the most cost-effective low and zero carbon solution for any new-build building. The cost implications to the building structure/fabric are considered. For example, a PV array installed on a flat roof requires additional supporting structures whereas PV laminate on a low-pitch roof does not. All members of the design team should understand the operational carbon targets set for a project and their role in achieving them. Targets should be included in their briefs/contracts with a requirement to undertake their part of the work necessary to achieve the target. It can be useful to appoint a ‘carbon champion’ on the project who would be responsible for delivering the target. This is often the role taken by either the building services engineer or the BREEAM assessor. It is important to understand the breakdown of energy use within the building so that measures can be targeted where the greatest reductions are achievable. The likely occupancy pattern of the building should also be considered early on in the design process since this will affect the energy demand profile of the building. For example, a large commercial office building operating 24 hours a day will have a far higher lighting and heating demand than one only operating during normal business hours. The National Calculation Methodology (NCM) which is used for Part L compliance, applies a standard activity schedule to different building types and therefore cannot take into account different occupancy patterns. This is a limitation of the NCM and is an example of where operational carbon compliance modelling is not able to accurately model/predict actual emissions. Site constraints, including building orientation, can have a major effect on a building’s operational energy requirements and on the viability of integrating LZC technologies. Site selection can therefore be a key issue. Most site constraints for large city centre buildings are far more onerous than for other non-domestic building types such as schools, retail, industrial and leisure buildings which are more typically (although not exclusively) located outside city centres. The design team must therefore be fully aware of the viability of available LZC technologies and the constraints imposed by the site. They will also need to look beyond the site boundary for opportunities to integrate with other offsite LZC technologies and other buildings and networks. The ability to integrate into (or initiate) a low-carbon district heating system, for example, may have a large positive impact on the cost-effectiveness of constructing low carbon, city centre commercial buildings and therefore should be given due consideration early in the design process. Although energy efficiency measures can deliver significant carbon savings, in most new non-domestic building types, the glazing and solar shading strategy is likely to be the most effective means to deliver cost effective carbon savings. The glazing strategy will have a significant impact on the cooling load, the requirement for artificial lighting and the energy required for space heating. East and West facing glazing should be minimised with an emphasis on North and South facing glazing. Glazing with a sill height less than around 1m does not generally provide much useful daylight, but does increase the cooling load in summer and heating requirements in winter. South facing glazing should have external solar control measures to block high-angle sunlight in summer whilst allowing the useful low-angle sunlight to enter the building in winter. Improving lighting efficiency is often important to deliver cost effective carbon savings. Lighting typically contributes over a quarter of the carbon dioxide emissions of commercial buildings and over 70% in warehouse buildings. Therefore optimising the lighting design in conjunction with the glazing strategy can reduce energy use significantly without major capital cost implications. Lighting energy use can be dramatically reduced through good design involving efficient lighting layout and use of low energy lamps and luminaires with high light output ratios (LOR). Lighting controls should also be carefully designed in order to facilitate efficient use of the system. Well placed user controls combined with automatic controls including daylight dimming and occupancy-sensing controls can have a dramatic impact on lighting energy use particularly when combined with a well-designed glazing strategy. It is important however that these systems are designed to suit the building users otherwise there is a tendency to override automatic controls, leading to greater energy consumption. Using waste heat from space cooling to provide hot water. The energy required by ventilation systems can be significant in commercial buildings. This can be reduced through the use of low energy fans and pumps. The positioning and size of plant rooms can have a dramatic effect on the energy used in ventilation systems. The amount of energy used by fans increases as ductwork becomes longer, narrower and includes more bends and therefore structural and M&E engineers have a role to play in designing more efficient ventilation systems. The choice of delivery system for heating and cooling can have a dramatic effect on the performance of a building. Chilled beams lend themselves to the thermal characteristics of heat pumps allowing the two technologies to offer a greater overall efficiency when linked together than when used separately. An alternative to chilled beams is to integrate the heating/cooling system into the structure of the building, so called water-cooled/heated slabs. By embedding the pipework into the floors, a similar performance to chilled beams can be achieved without the visual intrusion. Once energy demands have been reduced and efficient baseline HVAC systems selected, the introduction of LZC technologies should be considered. The Target Zero guides give detailed guidance on the cost effectiveness of different generic LZC technologies for different non-domestic building types. Many LZC technologies will require larger plant space (than conventional heating and cooling systems) and some require access for fuel delivery and storage; this needs to be considered in the design. Once LZC technologies have been selected they should be integrated into the design at the earliest opportunity to enable efficient integration and reduce capital expenditure. If the building is to be connected to a district heating system then the capital cost can be reduced if plant rooms for heating systems are kept close to street level. If biomass fuel is to be delivered to site then delivery access will be important and should be considered very early in the design process. The cost effectiveness of LZC technologies which provide heat rely on there being a sufficient heat demand. Therefore the effectiveness of low carbon heating technologies is reduced when they are used on highly insulated buildings. The size of wind turbines that can be installed on-site will be restricted by site and other, e.g. planning, constraints. As a general rule however, where on-site wind turbine are viable, the most cost effective approach will be to install the largest possible turbine. The impact of structural form on the operational carbon emissions from non-domestic buildings is generally small. The table gives the results from dynamic thermal modelling of different structural forms of five different non-domestic building types. The perceived wisdom is that heavy weight solutions are generally more energy efficient, however the variation is 1% or less in all cases. Buildings with high thermal mass are constructed from materials which have a large capacity to absorb and store heat. Careful utilisation of this effect can help to stabilise internal temperatures and reduce summer cooling loads. However, it can also have the effect of increasing the energy required for space heating if, by exposing the floor soffits, the volume requiring heating is increased. The interaction of these impacts is complex and depends on the balance of heating and cooling in the building in question. Where it is decided to utilise thermal mass in a building, studies have shown that, at most, it is possible to mobilise about 75-100mm of the structural depth of the exposed soffit. This is available in all common steel floor systems. Thermal mass is only really effective when it is directly exposed, most commonly by leaving the soffit of the floor above the occupants exposed. Frequently this does not occur in modern buildings which often have false ceilings that isolate the thermal mass. Exposing the thermal mass can also have detrimental impacts on aesthetics and acoustics which can be costly to overcome. Thermal mass is only effective at providing a stable internal temperature if the heat stored in the fabric during the day is dissipated at night. Modern buildings are required to be well insulated and so this dissipation of heat cannot happen unless external air is allowed to circulate inside the building; so called night cooling or purging. If this does not take place then each morning the building will still be warm from the previous day and so a steady build up in temperature can occur during prolonged periods of hot weather. Night cooling can be provided either mechanically or naturally. It can be as simple as leaving windows open to allow cool night air to circulate inside the building. However this approach is often difficult to achieve due to the associated security risk. An alternative is to provide mechanical ventilation which runs through the night although this can consume considerable electrical energy and hence be counter productive. Unless the energy consumed in cooling the building is a significant proportion of its total energy demand then the benefits of thermal mass are generally small and may even increase the building’s carbon dioxide emissions unless the ventilation is carefully controlled to maximise night cooling. There are situations where it may be appropriate to consider a naturally ventilated, thermal mass solution to reduce operational carbon emissions. However, there are often other important factors that can mitigate against this. Furthermore, any presumption of improved operational energy performance of a heavyweight building should be tested using dynamic thermal modelling. The choice of structural option often affects the envelope area of the building. Buildings with a greater surface area will experience a larger amount of heat loss; this will increase the heating energy requirement in winter, but may also reduce the cooling load in summer. Programming implications: both on‐site and supply. CHP systems, for example, might have a long lead-in time. Plant room size will vary according to the LZC technologies that are to be used in the building. For example, biomass boilers will require additional storage space for wood chip fuel and for ash as well as access for fuel deliveries and waste collections. For buildings connected into district heating schemes, plant room size could be much smaller than required for traditional plant particularly if no backup plant is required. Similarly, the use of on-site technologies such as ground source heat pumps can result in smaller plant rooms, if no backup or supplementary heating or cooling plant is required. As regulations are tightened to reduce operational carbon emissions from new buildings, the relative importance of embodied carbon impacts increases. The table shows the ratio between the embodied carbon and the annual predicted operational carbon emissions for five different non-domestic building types and for different possible future operational carbon reduction targets. 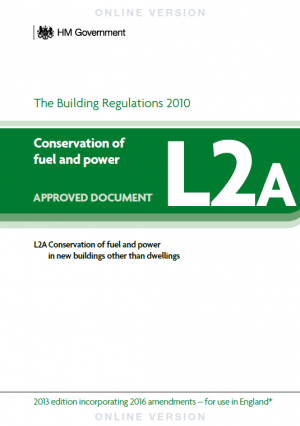 The buildings are those studied under the Target Zero programme and therefore the base line is a Part L2A (2006) compliant building. The table shows for example, that for the Part L2A (2006) compliant school building, the embodied carbon in the building is exceeded by the operational carbon emissions after 8.4 years of building operation. This ratio increases to 44.2 years under the scenario of a 100% reduction in regulated carbon emissions. These results are indicative only however since, as UK energy production is decarbonised in the future, the embodied carbon of buildings should also reduce. The most recent government sponsored research into Carbon Compliance targets for new non-domestic buildings suggests that the averaged reduction in regulated emissions (via energy efficiency and on or near site LZC technologies) required to achieve the 2019 ‘zero carbon’ target will be between 44% to 54% (relative to Part L 2006) with the balance achieved via the use of allowable solutions. At these levels of reduction, the predicted ratio of embodied:operational carbon for these buildings over a 60-year design life is between 1:4 and 1:8 suggesting that even in 2019, when designing new 'zero carbon' buildings, designers can still make the greatest impact by addressing operational carbon rather than embodied carbon. A simplified carbon footprint tool for buildings is available. ↑ DFP Technical Booklet F1: 2012 - conservation of fuel and power in dwellings, Department of Finance and Personnel. ↑ DFP Technical Booklet F2: 2012 - Conversation of fuel and power in buildings other than dwellings, Department of Finance and Personnel. ↑ DFP Amendments to Technical Booklets F1 & F2: 2014, Department of Finance and Personnel. ↑ Building Regulations 2008 Conservation of Fuel and Energy - Buildings other than Dwellings Technical Guidance Document L, Department of Environment, Heritage and Local Government, 2008. ↑ Building Regulations 2011 Conservation of Fuel and Energy - Dwellings Technical Guidance Document L, Department of Housing, Planning, Community and Local Government, 2017. ↑ Fabric energy efficiency for zero carbon homes - A flexible performance standard for 2016. Zero Carbon Hub.